A state funeral or lying in state was refused to King by then-governor of Georgia Lester Maddox, who had considered King an "enemy of the country" and had stationed 64 riot-helmeted state troopers at the steps of the state capitol in Atlanta to protect state property. He also initially refused to allow the state flag to be lowered at half staff, but was compelled to do so when told that the lowering was a federal mandate. After the shooting, King was taken by ambulance to the emergency room at St. Joseph's Hospital and was pronounced dead at 7:05 p.m. King's closest aides contacted Robert Lewis Jr.—a local funeral director who had coincidentally met King two days prior—to retrieve his body and prepare it for viewing. Per King's request, his good friend Mahalia Jackson sang his favorite hymn, "Take My Hand, Precious Lord", though not as part of the morning funeral service but later that day at a second open-air service at Morehouse College. 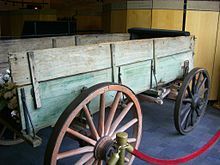 The private funeral was followed by the loading of King's casket onto a simple wooden farm wagon pulled by two mules. The procession down the three-and-a-half miles from Ebenezer Baptist Church to Morehouse College was observed by over 100,000 people; the Southern Christian Leadership Conference commissioned a security detail to manage the crowd, while the Atlanta Police Department limited their participation to management of automobile traffic and to accompany dignitaries attending the events. The procession was silent, although it was accompanied on occasion by the singing of freedom songs which were frequently sung during the marches in which King had participated. ^ a b "The Assassination". Time Magazine. Jan 17, 2002. ^ Watson, Ben (Jan 19, 2009). "MLK's Funeral Director Shares his Story". WAVY.com. ^ Honey, Michael K. (2007). Going Down Jericho Road: The Memphis Strike, Martin Luther King's Last Campaign. W.W. Norton. ^ Kotz, Nick (2005). "14. Another Martyr". Judgment days : Lyndon Baines Johnson, Martin Luther King Jr., and the laws that changed America. Boston: Houghton Mifflin. p. 419. ISBN 0-618-08825-3. This page was last edited on 9 March 2019, at 05:20 (UTC).